She’s an old gal, this Pullman car #752, showing her age in tender and charming ways. Perched on steel rails, she’s ready to pull out again, if duty calls. So begins my 24 hours at the Chattanooga Choo Choo Hotel, where I slept in a vintage train car and lived for a day in a world where life is slower. My husband and I arrived at Chattanooga’s Terminal Station shortly after the standard 4:00pm check in time. The building’s repeating arches across the front façade create a grandeur not commonly found in modern architecture. Inside, the one story terminal building rises tall in its center, with an 82-foot high dome. At the time of construction, this was one of the highest free-standing domes in the world. It is impossible to resist looking upward at the painted dome with encircling skylights, which add elegance and an old-world charm to the train station’s main waiting room and ticketing area. I sauntered to the terminal ticketing window to request my admittance into this magical world of train travel and was quickly accommodated with a train car room assignment and entry key. Train car 752 is our designated hotel room, which is half of a railway car. Stepping up a small metal stool and three iron steps we reached the landing between the connected railway cars. I entered tentatively, unsure of what lay ahead. 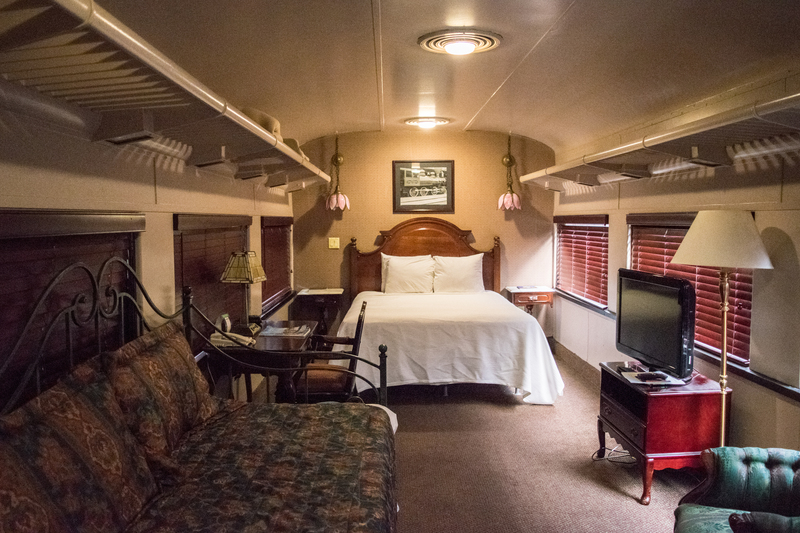 I was pleasantly surprised to see architecturally authentic items in the room – overhead baggage storage racks, lighting consistent with the spacing of passenger seating, and Victorian-style room decor. 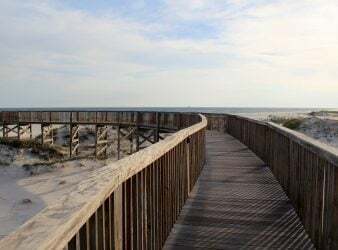 Updated guest conveniences offered another pleasant surprise – iron and ironing board, specialty spa toiletries, abundant vanity space, free Wi-Fi, bottled water, single-cup coffee and tea supplies, and a modern flat screen television. The metal dividing wall near the rear of the car remains intact. I walked the imaginary center aisle –20 steps to the other end of the room – tracing the footsteps of the eager travelers, the footsteps of the train crew, the footsteps of sailors and soldiers returning home. These steps bring a peaceful perspective. 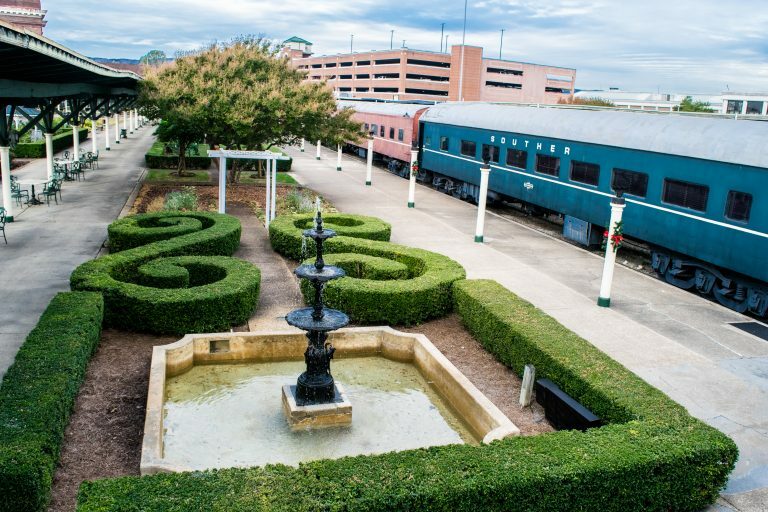 In addition to the Pullman train sleeper cars, the Chattanooga Choo Choo Hotel offers modern guestrooms and suites in the MacArthur Building at the end of the gardened courtyard. 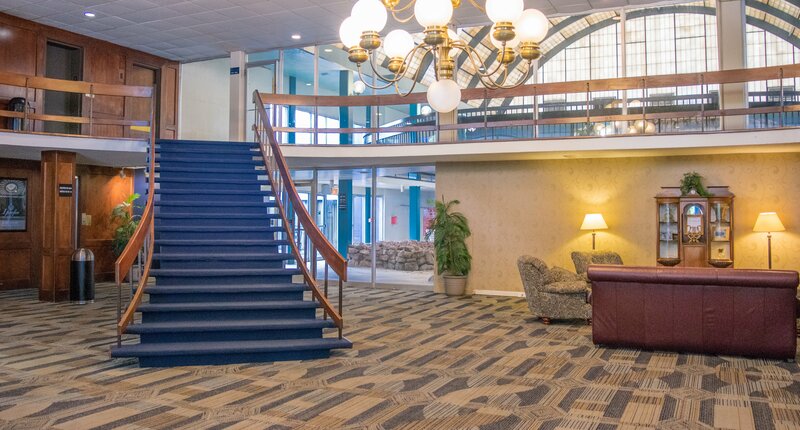 In this building, guests can enjoy the spa-styled indoor pool at any time of year. The pool’s patio area has tables and chairs for relaxing, visiting or enjoying snacks from the nearby vending machines. After a long travel day, pizza at the Silver Diner was the perfect meal for the evening. This train car (the silver one, of course) is located near the evening entertainment venues. Upon entry, the first few tables are “first class” with table cloths and ambient lighting. Towards the rear of the car, there are about a dozen dining tables in 50’s style décor. Oldies music crooned as we dined on freshly baked, made-to-order pizza. Build your own pizza in the 7” individual or 12” medium pie sizes or choose from several 16” pizzas on the menu. Canned sodas and bottled beers are available in a drink kiosk at the ordering counter. As the new day dawns, it’s time to eat again. 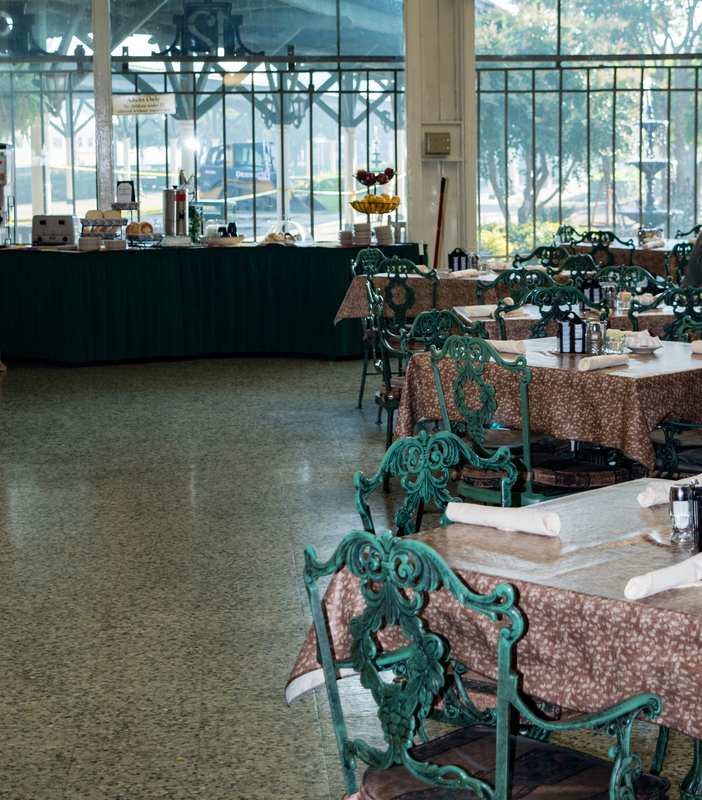 The Gardens Restaurant, in the main terminal building, features floor-to-ceiling arched windows, overlooking the railroad tracks and lush garden courtyard. 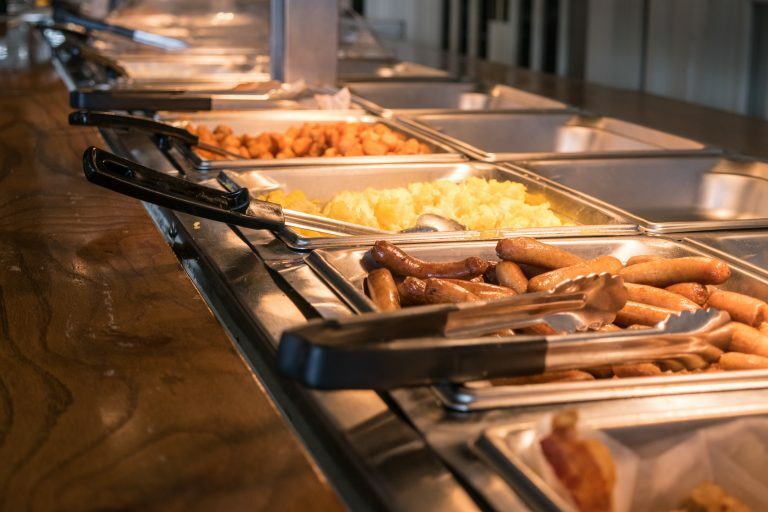 This restaurant offers a full buffet of hot and cold breakfast items. Sliced fruits paired with Southern-style biscuits under layers of creamy brown gravy composed a hearty breakfast. Other diners chose toasted bagels, cold cereals, French toast, eggs, or sausage links. After our delicious breakfast, it’s time to explore the grounds. We moved inside of the main terminal building. 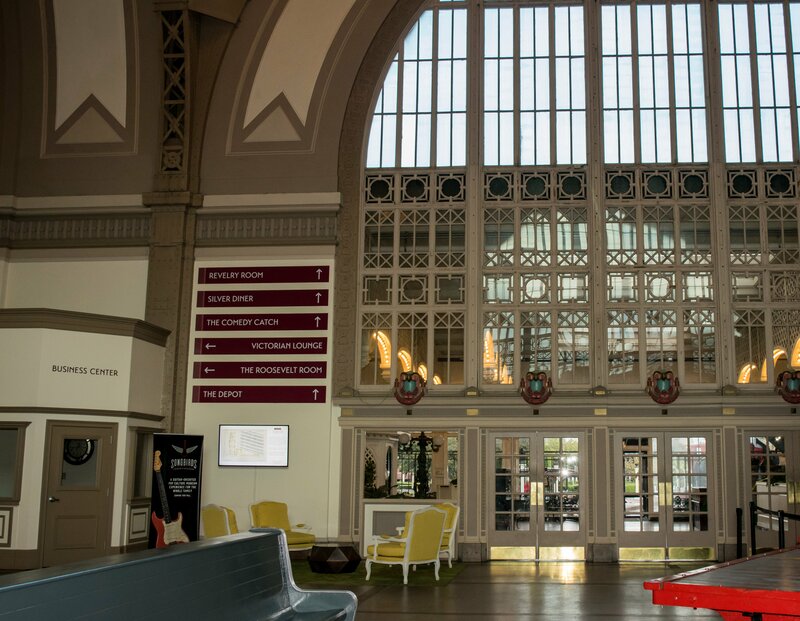 Comprehending the 14 original train tracks and 7 departure platforms, it is easy to imagine passengers shuffling about, gathering in the main terminal to connect with trains or to meet loved ones. Moving into the courtyard, we admired the manicured English-style shrubbery with statues and water fountain features throughout. The courtyard is cozy, hugged gently on the sides by the Pullman train cars and tucked at the ends by the hotel building and the main terminal. 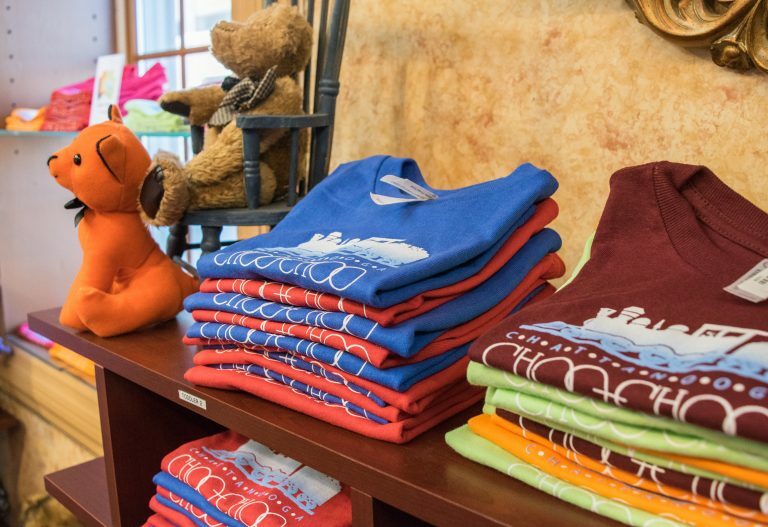 The Chattanooga Choo Choo Hotel is home to Sweetly Southern, a souvenir and gift shop, but so much more! 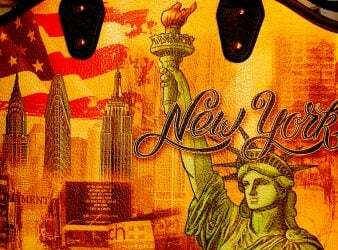 Here we found history books, patriotic flags, Civil War-themed chess sets, stained glass wall hangings, children’s toys, printed souvenirs and even the ever popular Moon Pie dessert treat. 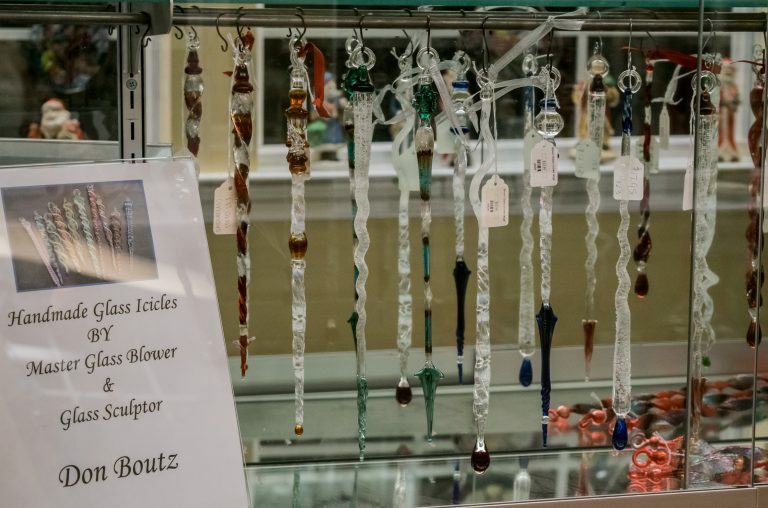 In talking with Don Boutz, the Sweetly Southern store has been a mainstay at the Choo Choo for more than 45 years. Don and his wife have established loyal customer base. Customers return year after year to shop the eclectic collection of merchandise. Boutz is also a master glass blower, creating stunningly beautiful glass icicles and collectible ornaments. While strolling in the courtyard, be on the lookout for the Orange Ambassadors. These are the experts on all things Choo Choo. Mr. Marvin is a local fixture and cheerfully sings the Glenn Miller classic “Chattanooga Choo Choo” song and all about Track 29. During the afternoon, we ventured away from the hotel property. It’s easy to fill an afternoon roaming the area – Tennessee Stillhouse (Making Up for 100 Years of Prohibition), Hot Chocolatier, and Star Line Books. All are within a block from the hotel entry. East Main Street, near the bookstore, boasts charming art shops and eclectic street art. Alternatively, head north (to the right) in front of the hotel for a few blocks to the Warehouse Row upscale shopping venue. 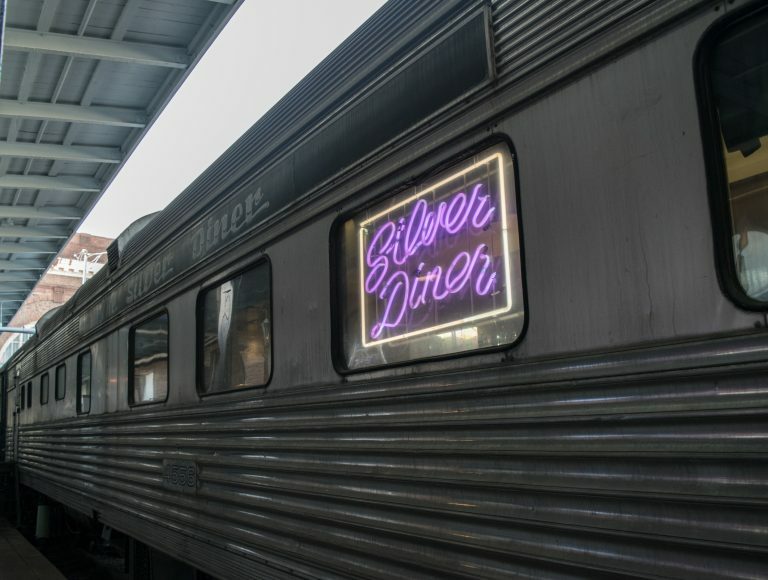 The train car hotel experience is intricately tied to the Glenn Miller classic big band song depicting a train trip from Pennsylvania Station to Chattanooga in one day and finding his love waiting at the terminal station. Listen to the song before your stay, or ask Mr. Marvin for a performance, to better understand how music, train travel, and an era are intertwined. 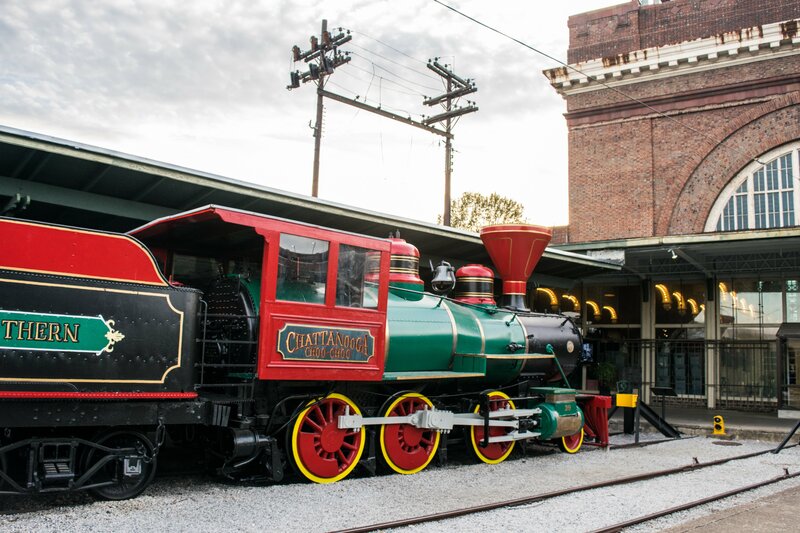 As train enthusiasts and historians, we thoroughly enjoyed our stay at the iconic Chattanooga Choo Choo Hotel. A crack here and there or continuing renovations were just part of the charm of the place. For me, a few dents and bruises are indication of a life well lived. 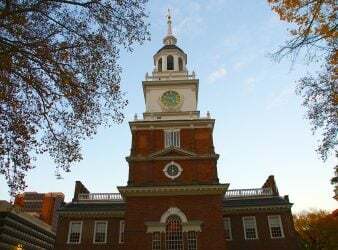 Embrace the history and this treasured slice of Americana. Find more about Gwyn’s journey through the Tennessee Valley at Small Towns, Big Stories on MilesGeek. Car 752! My wife and spent the first night of our marriage in that same car in November of 1987! We’ve passed through the Choo Choo countless times on our way to the Smokies. We originally lived in Huntsville and later Birmingham AL, so the Choo Choo made for a great stop. In writing your article, were you able to uncover any of the cars histories? Would love to hear more about your stay.